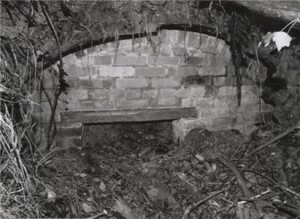 Remains of the Auxillary unit hide-out (since collapsed) at Kemp Hill Farm on the outskirts of Ryde in 1989. Picture copyright Ben Houfton/Adrian Searle. THEY were sworn to absolute secrecy about their existence when ‘stood down’ at the end of 1944.However, in remote areas of the countryside, it is possible to find the relics of the most secret of all the military forces which operated on the Island during the dark days of the Second World War. The IW was a strategic zone for the defence of Britain. Consequently, in addition to many military units and Home Guard, there was a well-organised band of ordinary people involved in what would have been the British resistance. Little was known about the shadowy ‘secret army’ — a well-trained corps of men specially selected to undertake ‘terrorist’ activities in the event of a German invasion. John Riddell, whose late father, L/Cpl Jack Riddell, was one such man, said: “These were the men who, at the time of invasion, would have simply ‘disappeared’ from their homes and workplaces to purpose-built and fully supplied covert underground operational bases. Selection was undertaken by recommendation followed by personal contact without the actual task being disclosed or recruitment formalities. Normal civilian work was retained with secret training and operations taking place during evenings and weekends. Those recruited into what were known as Auxiliary Units were given Home Guard uniforms and told they had secretly been assigned to one of three special battalions of the Home Guard — the 201st in Scotland, the 202nd in the north of England and 203rd in the south. Mr Riddell explained: “As not formally enrolled in anything military, these men could never claim protection by the Geneva Convention as afforded to all other uniformed fighting men. “The German authorities would have regarded them as terrorists and treated them accordingly if captured. They would have faced torture and execution when detected, if not killed in combat. “In the event of invasion and occupation, the men of the patrols were aware their operational life would be short-lived. So who were the members of the IW Auxiliary Unit? Historical author Adrian Searle said the man selected to make the initial contacts was Sammy Watson, a well-known estate agent and valuer, who also had a useful part-time role as secretary to the local branch of the National Farmers’ Union. In his book, The IW at War 1939-45, Mr Searle includes an account by Eileen Foss, who lived during the war at Godshill Park Farm, home of her father-in-law, another auxiliary unit member, who described the progress of Mr Watson’s secret army. She revealed those approached were mostly drawn from the farming community and known by Sammy to be trustworthy, discreet men. The two men in overall command of the Island groups were Capt H. C. A. Blishen, of Arreton, and Lt J. T. W. Fisk, of Brighstone. An inaugural meeting was held at the White Lion, Arreton, when guerilla tactics and the making and laying of booby traps were discussed. Other accounts researched by Mr Searle add further detail to the story. In the book, Charles Holbrook, an auxiliary member, recalled: “Inside the hideout, or observation base as it was known, we had four bunks and the means for cooking, with about 100lb of high-explosive time delays, detonators, both cortex and ordinary fuse — besides the Smith and Wesson revolvers and knives. Other men known to have served as group leaders include S. G. Taylor, of Arreton, and C. W. Burt, of Shalfleet. Mr Searle said there were plans to wholly evacuate the IW in the event of invasion, leaving only the auxiliary units in place to do their bit. Research by volunteers of the Coleshill Auxiliary Research Team (CART) suggested auxiliary unit patrols existed in Arreton, Shanklin, Godshill, Whitwell, Sandown, Brighstone, Calbourne, Chillerton, Cowes, Newtown and Ningwood. Mr Riddell said: “From other records, it is evident at least two patrols were operational in the East Cowes, Osborne and Whippingham areas. Information would suggest at least one operational base was hidden on the Osborne Estate. “Targets for the patrols certainly included Osborne House, which military sources indicate would have been an officers’ mess and a probable control centre for the occupying Wehrmacht and Gestapo. “Kingston Power Station on the Medina and the Somerton Airfield were the subject of patrol night exercises and therefore probable reconnoitred targets. In May 1944, during the final build-up to D-Day, members of auxiliary unit patrols in Northumberland were issued with railway warrants and told to report, in Home Guard uniform, to a local station. Following secret movement orders, and travelling in reserved compartments, they began a long trek to the south coast. Similarly, uniformed men joined the train at many stops en route. Transferring at Portsmouth to a Southern Railway ferry, the resistance men crossed the crowded Solent to Ryde. It was only then they were told the reason for their journey. Mr Searle said: “A German counter-invasion of the IW after D-Day was regarded as a very real possibility by the planners of Operation Overlord. When the counter-strike failed to materialise, the men left the Island and headed for home. Mr Riddell said the men of the auxiliary units should be remembered for what they did as well as what they might have done. “More than providing a force to combat German occupation, to defend parts of the country and to additionally test the security of the established forces, it gave opportunity to test theories about modern guerilla warfare for many years to follow,” he said. ON JANUARY 20, 1945, a significantly historical dinner was held at the Masonic Hall, Ryde. Gathered together for the first time in five years were the majority of the members of the Island’s secret guerilla organisation, which was formed and trained in readiness for the invasion of German forces. A copy of the post stand-down dinner menu for that Saturday evening offers evidence of the men involved. Headed ‘203rd (GHQ Res) Bn. Home Guard. Auxiliary Units’, it shows the area group commander was Capt H. C. Blishen MBE. Lt T. A. Cowley, Lt E. G. Rapkins, 2/Lt S. Taylor, Sgt H. Foss, Sgt J. Blackman, Sgt A. Newman, Sgt F. Buckett, Sgt C. S. Good, Sgt W. Buckell. Cpl A. F. Le Maitre (admin), Pte C. E. Herbert (shown as musical director for the event). Col R. E. Pickering (guest), Lt Col F. H. Fernie (guest), Maj N.V. Oxenden (guest, HQ Auxiliary Units), Lt Col F. Nevill Jennings. L/Cpl Jack Riddell, A. F. Maitre, C. L…., R. C. Ward, H. R. Watt, Stan Williams, J. Kennedy, W. Buckell, T. H. Farnie, E. S. Barton, N. V. Oxenden, Edwardson, H. Blishen, A. Shearwood, R. Pickering, S. Thompson, C. W. Brannon, J. Blackman, A. M. Long, A. W. Bowden, B. Keegan, R. Casson, J. W. R…., Edward Raphine, C. F. Rayner.